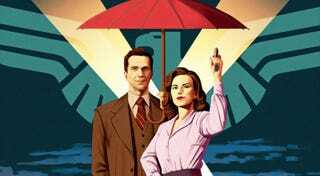 Agent Carter is on life support and Marvel’s Most Wanted is not getting a ton of love at the network. Which could leave Coulson and company alone on ABC until Damage Control finally gets on the air. The Hollywood Reporter has picked out the 10 pilots that are most likely to get a full series order. Number three on the list is Conviction, a courtroom drama that has Hayley Atwell as the star. At the time her casting was announced, the line was that she’d film both Conviction and Agent Carter at the same time... assuming, of course, that Agent Carter got a third season. The Hollywood Reporter pointed out that not only is a third season of Agent Carter considered “highly unlikely,” but that passion for Marvel’s Most Wanted is cooling and it’s not “considered the lock it once was.” Agent Carter’s cancellation, if and when it officially comes, won’t be a huge surprise. The show struggled in the ratings quite a bit. THR’s take on Marvel’s Most Wanted slightly more dire than what Variety has heard, which is that the show isn’t no longer practically guaranteed a series, but still has a decent shot. Marvel’s Most Wanted spins off Lance Hunter (Nick Blood) and Bobbi Morse (Adrianne Palicki) from Agents of SHIELD, which has always struck us as the blandest possible way to expand Marvel’s television universe.We’ll see if a bit more network resistance makes them stretch in interesting ways.